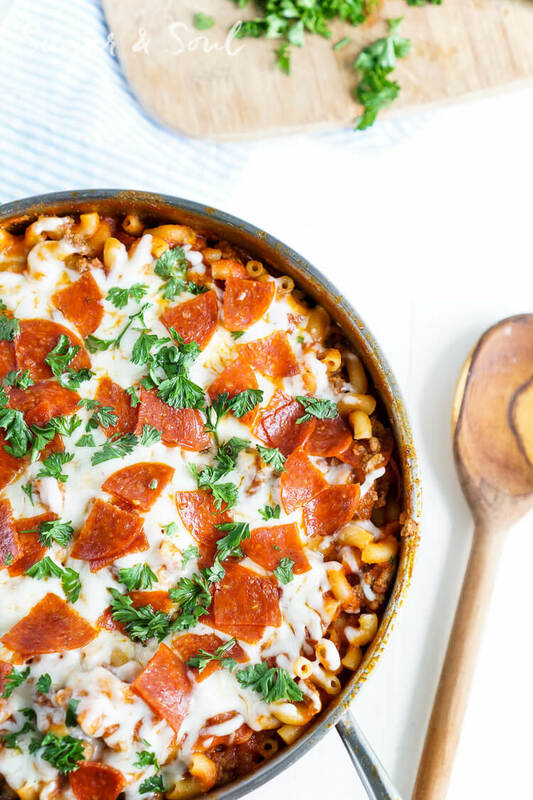 This One Pan Pizza Pasta is what weeknight dreams are made of! 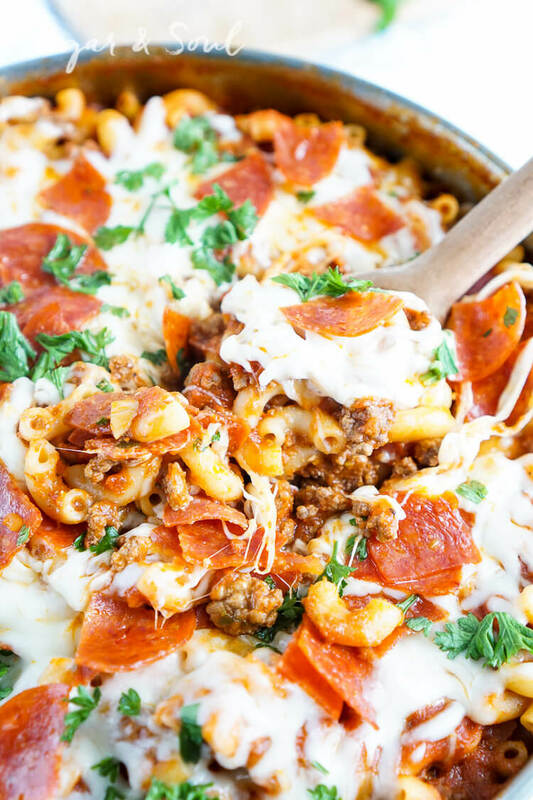 Pizza and pasta come together in an easy meal loaded with flavor that’s ready in less than 30 minutes! 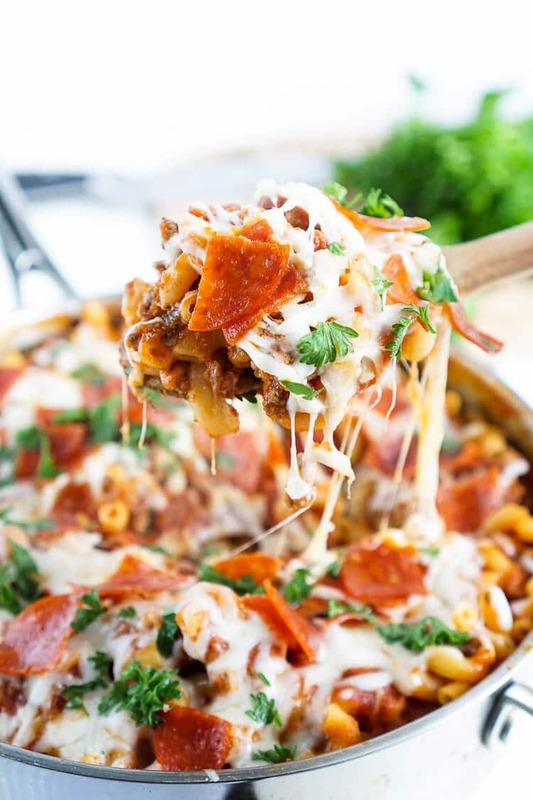 This Pizza Pasta is one of our go-to weeknight meals because it’s so easy to make and the perfect mashup of two of our favorite foods! But most importantly, I want as few dishes as possible. Because let’s face it… they’re probably going to sit there a couple of days. Also true to my millennial nature, or maybe it’s my American one, I can’t get enough pizza or pasta in my life. So when the idea came to me to combine the two, I was like, well that’s bloody brilliant! This dish serves 6-8 so it’s perfect for a family. But it’s also great for young couples and individuals like Matt and I. 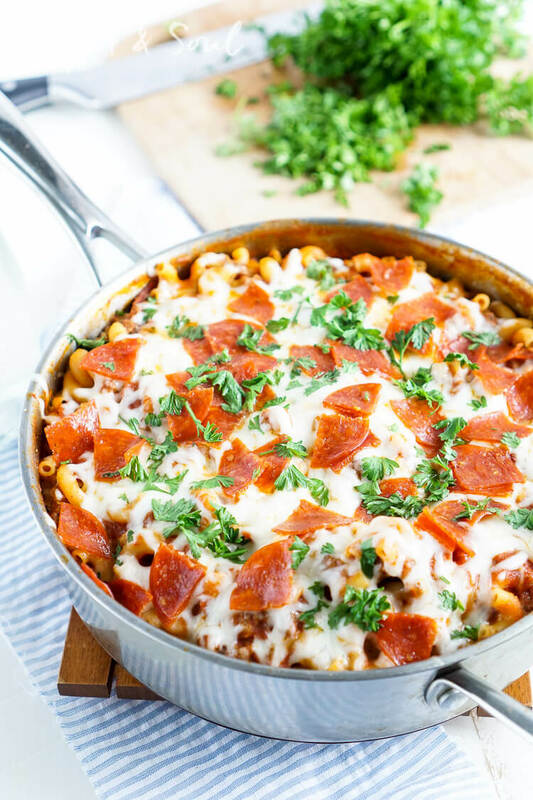 This dish reheats amazingly and makes for a few good meals for each of us… so this is more like a one pot for three days kinda meal… pretty awesome if you ask me! See you want to run out and grab all of the ingredients right now, don’t you? You should, this Pepperoni Pasta won’t let you down! In a large high-lipped stainless steel skillet, cook ground beef with salt, pepper, and garlic powder over medium-high heat until browned, about 3-4 minutes. While beef is cooking, quarter the pepperoni and add 75% of it to the pan with the beef, cook for 2 minutes. Add in pasta sauce, water, and oregano and stir. Add in Barilla Pronto Elbows and stir until well combined, let simmer for 12 minutes, stirring occasionally until the pasta has absorbed most of the liquid. Pour pizza sauce over the top of the pasta, sprinkle with mozzarella cheese, remaining pepperoni, and parsley. Cover and cook for another 2-3 minutes until cheese has melted, remove from heat and serve hot. 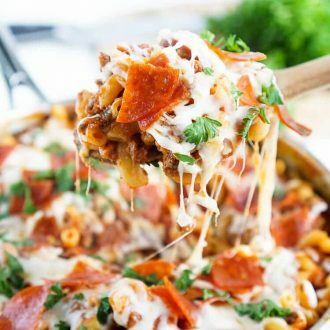 Pin this Pizza Pasta Recipe for Later! 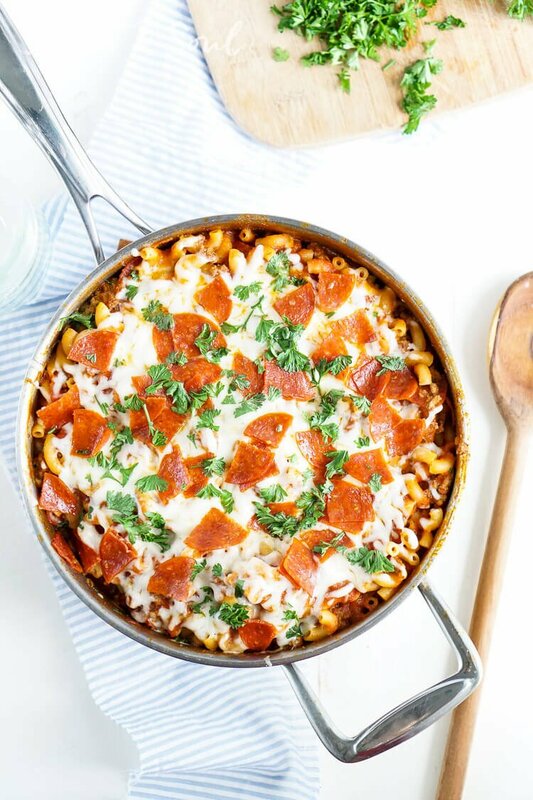 This One Pan Pizza Pasta is what weeknight dreams are made of! 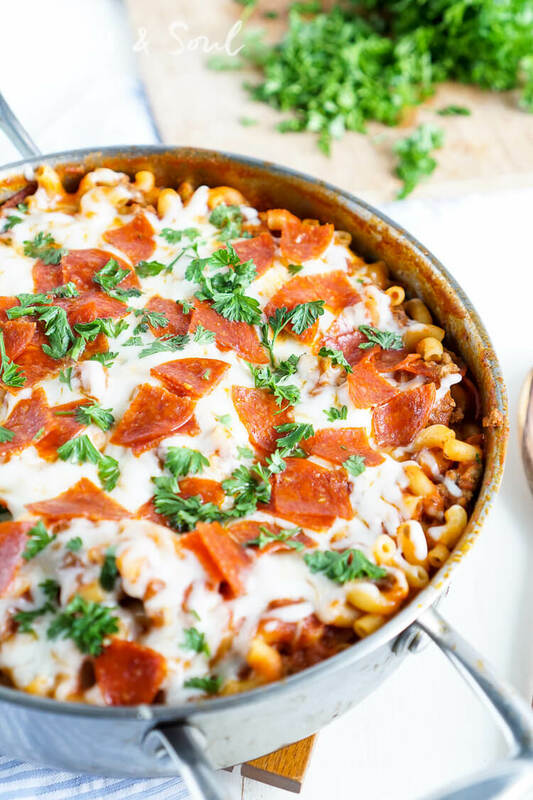 Pizza and pasta come together in an easy meal loaded with flavor that's ready in less than 30 minutes! Add in Barilla Pronto Elbows and stir until well combined, let simmer for 12 minutes, stirring occasionally until pasta has absorbed most of the liquid. For an added kick, add in a tsp of crushed red pepper.